As mentioned yesterday, the final step in the hair colour journey is now complete. I am so excited about it! I would probably describe the colour as a dark warm blonde. It's like sand mixed with a bit of honey and exactly the kind of tone that I was after. This was all done in a relatively short timeframe but for each visit we assessed the integrity of my hair and made sure that it could handle the process. It could but if I don't deep condition it from this point on then I will be in for a massive b*ll*cking from my hairdresser, Anthony. 1) You don't need as much make up - lighter hair softens features I think and makes it easier for me to feel like I can get away with less. Having said that my less is probably someone else's plenty. 2) Product and grime turn the colour brassy - I noticed this the other day. When there is too much product in the hair, the colour dulls itself down and becomes slightly brassy. This is a problem for someone who likes to spray in Oribe Dry Texturising Spray as liberally as I do. I'll have to control myself! 3) Maintenance is scary - it's fortunate that my hairdresser is also a good friend as we will be seeing each other on a regular basis to tackle roots. Not only that but the other challenge is keeping the colour the right side of blonde. Looks so good on you! Uhh I really want to do it now. Yay, it looks gorgeous! I'm so amazed how well it works for you given the dark hues of the past. I'm taking this pic and post to the hairdresser next time I go if that is ok. This is the perfect blonde on you, Laura! I went blonde last year before I slapped on the turquoise dye, I looked more like Nicki Minaj. Mleh. Love your hair, you look amazing. It’s gorgeous! Would love to see a post on what products you will be using/are using! Recently got my hair lightened too so not sure what to use! Thanks Nora - I'll have to get that sorted ASAP and then do a post about it! I went from brunette to blonde a few years ago but changed it back to brunette after a little over 2 years.. I just hated having to have my roots touched up so frequently & the constant use of silver shampoo to keep it from turning brassy.. Not trying to ruin this for you though hah, you look amazing! It took a long time to get here but so happy with it! Best of luck with yours! very pretty! Wear your natural eyes though, I love dark eyes and blonde hair. Bottle blonde and blue contacts are a little too Paris Hilton, true? You are a very beautiful woman. We have pretty much the same color, I use coconut oil bi-monthly as a conditioning treatment that doesn't turn my hair brassy and it smells wonderful. It's definitely a process and patience pays off eventually. I've heard stylists say that sometimes blonde never turns out the way someone wants it, so you're lucky. :) I love caramel blondes. Looks really great on you, Laura! The effort payed off - it looks lovely! I love your blonde hair. You are looking great! It really suits you! But coloring is so high maintenance! Your hair looks amazing Laura, the colours look really natural & as they say...blondes have more fun!!! It really suits you! You're gonna love it for summer as well. I was brunette for a while but now I'm blonde again I can appreciate how much brighter my face looks! 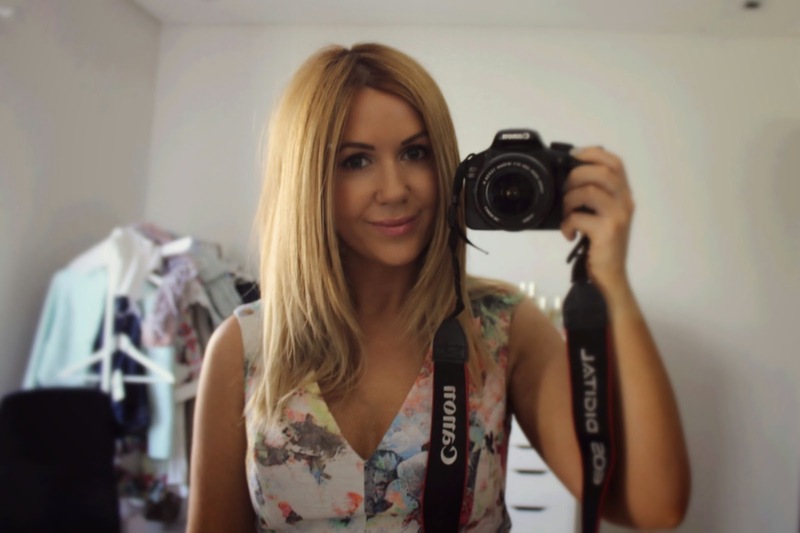 Your new blonde locks look gorgeous Laura! Love the hair! Do you like Miss Manga mascara? I've been eyeing it for a while yet hesitant to buy it! Looks gorgeous, you can totally pull off any shade you lucky lady! Please update us about maintenance! Some of us need to be walked off the blonde ledge, and others of us might be ready to jump once we find out. You should check out Kevin Murphy texturizing beads. They give some awesome bed-head and might keep away the brassyness. lush daddy O shampoo mixed with your usual shampoo. Works as a toner. Is a must for blondes. As a California blonde - I know. We offer a wide range of high quality 100% real human clip in hair extensions in various styles. Yes, with our easy to use clip-in hair extensions, be prepared to catch those envying glances.